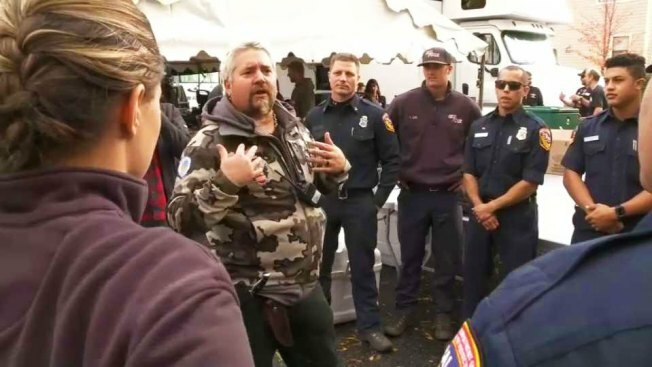 Celebrity chefs Guy Fieri, José Andrés and Tyler Florence could not replace the homes but they did what they could to allow first responders and survivors of the deadliest and most destructive wildfire in California to feel at home by cooking them all a Thanksgiving meal. The restaurateurs rallied a group of around 100 chefs and 800 other volunteers in Chico in partnership with World Central Kitchen, nonprofit food relief organizations founded by Andrés, to cook and serve 15,000 meals. The brave fire fighters of Cal Fire. "The least we can do today on Thanksgiving is all coming together to show the people what they deserve: love and support. One plate of food at a time," Andrés said. WC Kitchen has been working to serve hot meals to firefighters and evacuees for days. Andres said Wednesday that the organization has "probably" made over 200,000 meals since the operation started. Former California Governor Arnold Schwarzenegger even stopped by Thanksgiving Eve to lend a hand in the kitchen. "Handing out some sandwiches here, especially high protein sandwiches today because I made them," Schwarzenegger joked.